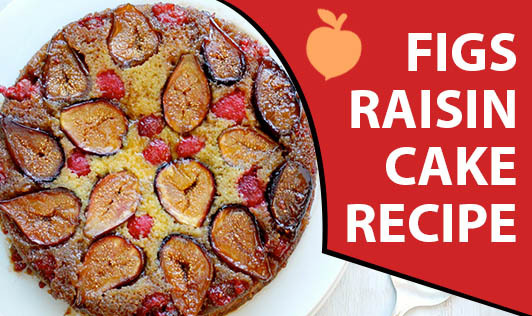 Fresh figs and raisins shine in this delicious spice cake made in a bread pan. You can also bake this in an 8- or 9-inch square pan or as muffins. Reduce the baking time accordingly. •Pre heat the oven at 375oF. Grease a standard bread pan. •Add flour mixture, half at a time, to the wet ingredients. Blend until smooth and combined. Fold in figs and raisins. Pour into prepared pan and bake for 35 to 40 minutes and at 375oF. •Let cool to room temperature before slicing to serve.